The Quality Concerns Management Process describes the process that will be followed for all education and training quality concerns across Midlands and East. The process is intended to ensure that there is a clear audit trail and evidence base, please see the flowchart for more details of the governance processes supporting this. The Risk and Quality Oversight Panel will review all risks identified as scoring a risk assessment of 12 or above. The panel will provide a strategic review of all highlighted medical and non-medical quality concerns, providing a multi-professional and clinical perspective to risk assessment. It will recommend appropriate interventions, in conjunction with the advice from the ‘originator’ of the concern, necessary to better understand and mitigate risks in line with the national framework. The panel will provide assurance to the Post-Graduate Dean around progress with risk management activity and intervention where required. This panel will meet monthly with the ability for extraordinary meetings (actual/virtual) as required. "Anyone can raise a concern through this process." A clearly identified mechanism for the reporting of risk. 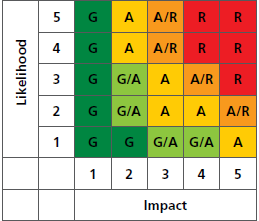 The HEE Corporate risk matrix supports the HEE Quality Cycle by determining the level of risk to education and training. Monitoring of Improvement Plans and progress against actions put in place.